Oh, boy. Tom Brady is back in the news, and it’s got nothing to do with this weekend’s upcoming Super Bowl. Nope. 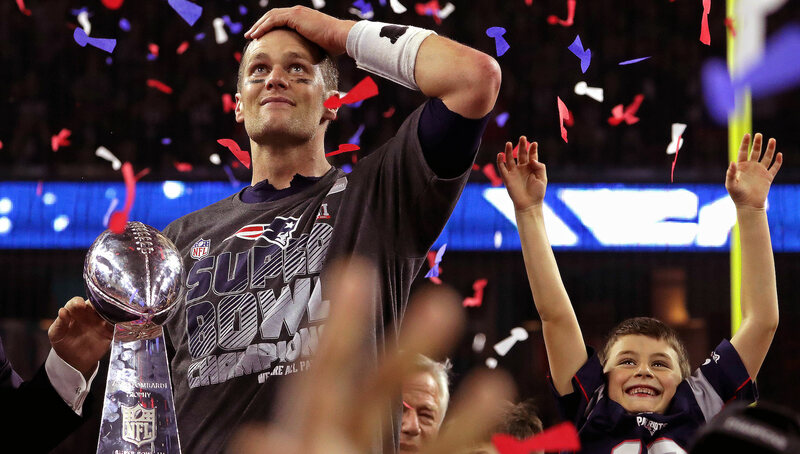 Once again, Tom Brady’s #DadLife is the focus of internet debate. You might recall that earlier this week/last week, a radio show host referred to Brady’s 5-year-old daughter, Vivian, as “an annoying little pissant.” The host was referring to a scene featuring Vivian in Brady’s new Tom Vs. Time Facebook docuseries. Star Patriots quarterback Brady shut that smack talk down like a defensive linebacker/all-around rock star dad. So what’s the Tom talk about today? Well, the internet can’t decide if an affectionate smooch between Brady and his son — in the same documentary — was a little too cozy for comfort. Poor Brady. We’re pretty sure all this ruckus about his family life was not what he had in mind when releasing said documentary. But go ahead. You can decide for yourself whether you’re weirded out by the father-son bond between Brady and his 11-year-old son Jack (with ex-girlfriend, actor Bridget Moynahan). Brady also has son Benjamin, 8, with wife Gisele Bündchen. In the scene in question, Brady is getting a sports massage at home when Jack wanders in to check his fantasy football standings. CBS2 even sent a reporter out onto the street to see what New Yorkers thought. Mind you, New York in general is not a fan of the Patriots, so that might not have been the prime place for unbiased on-the-ground polling about the Pats’ star QB. Others, meanwhile, have called out the trading-a-kiss-for-a-favor dynamic as the problematic part of the scene. “I don’t think affection should ever be tied in with a favor,” said parenting expert Carolyn Meyer-Wartels to CBS2. Brady has not remarked on the hubbub, at least not yet. But this is no doubt the last thing he and the Patriots want to be worrying about at the moment.